Brussells Griffon, hunting dog or cute pet? This is just one of the three types of Griffon: The Brussels Griffon, Belgian Griffon and Petit Griffon. 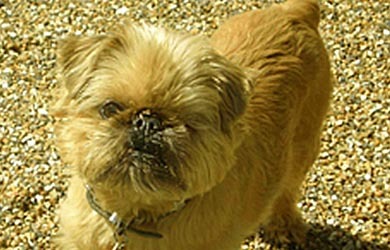 The Brussels Griffon is distinguished by having a long wiry non shedding coat with a fringe around the face. Its history traces back to 1880 in Brussels however it is also known that it was used in the 17th century by cab drivers to chase vermin away from their homes. In current times the dog is known mostly as a companion dog. Relatively rare, these are a smart happy dog, but with great hunting instincts. Like many terriers they ar known to be affectionate, curious and active, and crave human company. They can be difficult to house train and should be fed a good raw diet, not scraps, to keep a healthy appetite and physical appearance. Like other terriers, boundaries and training are important to keep the dogs happy and non aggressive. If training and leadership is not provided, the Brussels griffon can give over to guarding, separation anxiety and biting. These are not Brussels griffon traits, but the symptom of poor dog management. Brussels Griffon Grooming: These dogs have two types of coats, rough or smooth. The rough coat is dense and wiry while the smooth coat variety (known as the Brussel’s Petit Brabancon) is short, tight, glossy and straight. The short coats are much easier to maintain. The Brussels griffon coat is the wiry variety and can require daily brushing to reduce tangles. This is why the body hair is often clipped short. They shed little to no hair. Without proper exercise and training the griffon can become wilful, obsessive (food guarding), annoyance barking and dangerous around small children. Poor training also makes them particularly sensitive and unstable. Patience is required in training and they can exhibit shyness and be ‘offended’ when neglected or corrected. The good news is that if you are a dedicated owner, you can mould their personality from berth, and keeping their hair clipped short will give you a happy low maintenance dog.